GYMAX Electric Treadmill is a motorized power fitness equipment for walking, jogging and running with an 800-watt power motor and a folding design for home gym use. Being a very new release treadmill we can’t see many reviews online yet but a customer rated it 5 stars. Black Gymax Treadmill weighs 59 pounds and measures 56L x 24W x 45.5H inches when assembled. It is very lightweight and has a compact space saving design and can be folded manually to 37.4L x 57.9W x 26.8H inches. You can move and store it in a convenient corner With a heavy-duty frame of good quality steel it has a user weight capacity of 220 pounds. The running belt is made of solid ABS plastic and the running belt is PVC. You can feel both comfortable and stable on the running belt that measures 38.2L x14W inches, which is OK for a compact treadmill. But if you are a large person then it may be a little hard to move around. 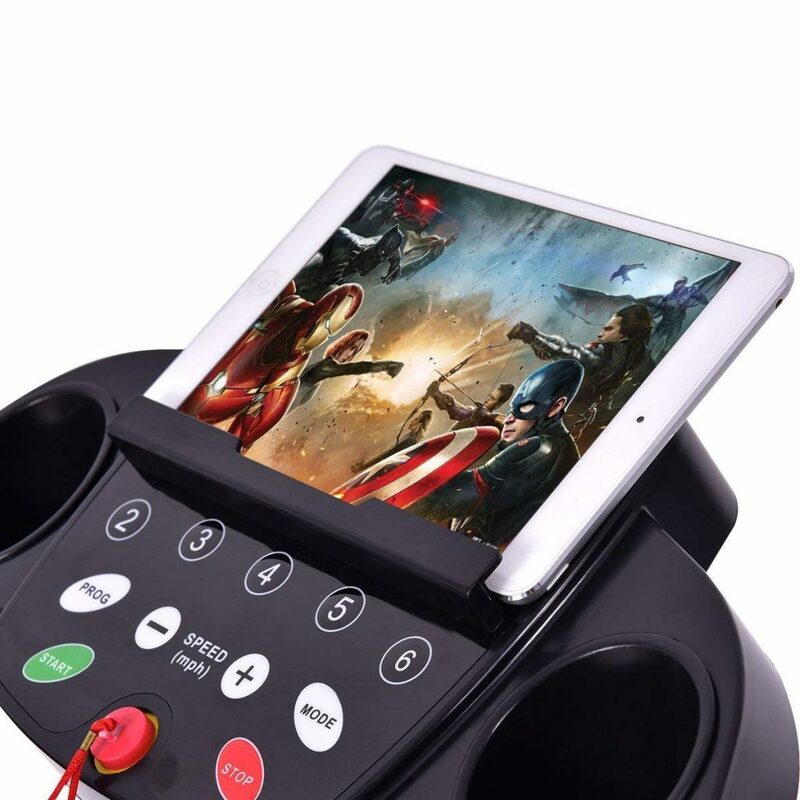 It has an iPad/tablet or smartphone holder just above the LCD display panel. You can listen to music or watch a movie on your tablet or iPad, chat on Skype with your mates, be entertained or distracted so you can work out for longer. There is a convenient emergency stop button on the handrail and the red Safety Key on the display panel with a red cord that you can attach to your clothes. So the treadmill stops safely if you drift back suddenly. You’ll see your speed, calories, distance, time, scan and heart rate connected to the handle sensors on the multi-functional LED display panel. It will help you stay motivated, keep you on track to achieve your workout targets faster. Both the left and right handrails have the Start/Stop and Speed +/- functions. 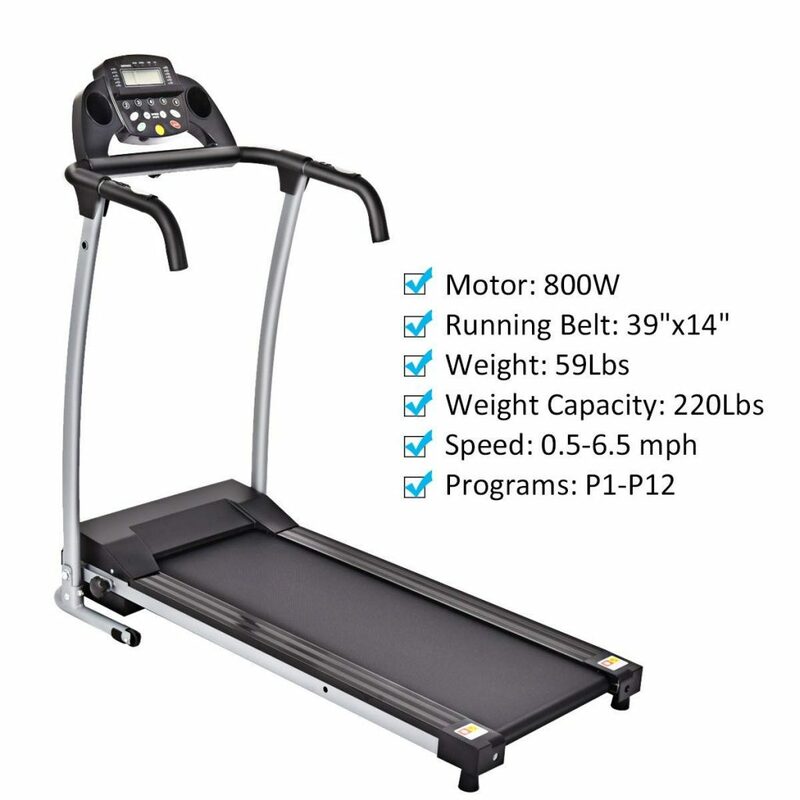 This low cost electric/motorized treadmill can offer you a great cardiovascular workout solution in the comfort of your home, especially if you’re too busy with work to get to gym or exercise outdoors because of bad weather. The voltage is 110 Volts and 60 Hz frequency and the plug is the standard US plug. You can walk, jog or run between the speeds of 0.5 and 6.5 mph speeds. You may select from the 12 preset programs (P1 to P12) to start working or set your own speed as you go. We recommend that you change your speed throughout your workout to speed up the calorie burning. The company makes sure the treadmill is packed properly before going out on the market. But if you encounter any problems during shipping please email their customer support team. And they will be happy to help with the replacements of parts or offer you a decent solution. It runs fairly quietly and you, people in your house or your neighbors will not be disturbed. There is no automatic or manual incline on this treadmill and you’ll be walking or running on a flat surface at all times. They seem to be a company that stands behind their products as they offer an impressive three-year warranty as well as a hundred percent satisfaction guarantee. This means you can return it and ask for a refund if not fully satisfied.